Did a search and surprised to not find a thread on this movie. 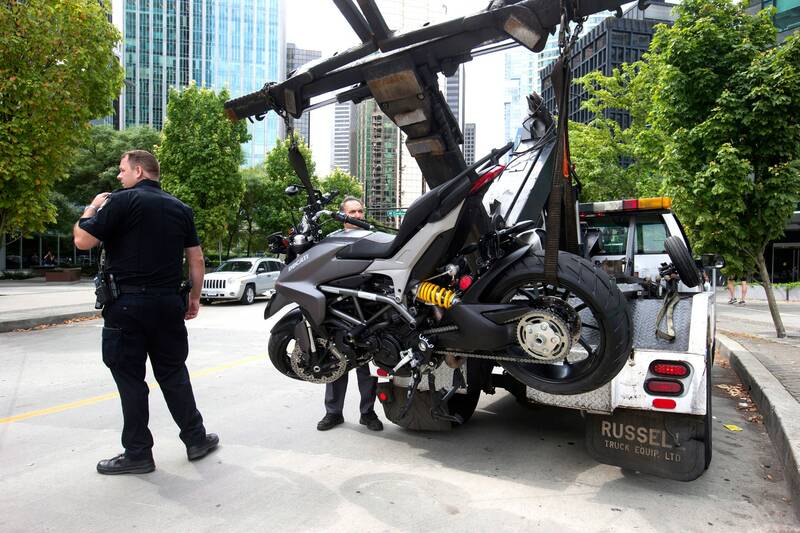 It was filmed in Vancouver last year and you may recall a stunt rider Joi “SJ” Harris tragically died during filming. They were using HS939s for the stunts in the movie. They are wrapped, I think, in matt grey, I assume this is why they went for the HS and not the HM, because the HM has a red frame. The one involved in the crash was written off but the other bikes used in the movie are for sale. I just picked up one, it has 1km on the clock! No way! Pics ! Gimme gimme gimme! That's great you scored a new bike ... hopefully at a nice discount? Are you in the film business? Sounds like you were in the right place at right time. Friends of mine worked on the Matrix movies (1,2,3). They used a BUNCH of Ducati's on that movie (999's and such) ... no idea who got the leftovers. I visited the set once ... they used at least 10 Ducati's on those movies. I'm really surprised to hear this as usually the stunt teams are so good, it's rare to see injuries let alone a death. Very sad. Any details regards what went wrong? A lot of us knew SJ. She was a great person, but not a seasoned stunt rider. She rode down a set of stairs, got to the bottom and apparently whiskey throttled ridimg into the glass front of a building across the street. I was supposed to buy a HS939 new last year, but had some issues that forced me to pull out of the purchase. I sadly watched all the new bikes were sold and the HS discontinued. I'm now looking again, and was looking for a demo or a low mileage used one, then saw the same dealer in Ontario had 4. Quick call and he explained that they were sent from BC and were from the movie. My one was a spare apparently, or just used in the background, as it has no kms. They are all super low kms and priced fairly. I couldn't believe my luck, snagging a 2016 HS939 with 1km on it in 2018.
the grey wrap has been removed unfortunately, i like it. I just got the last bike they had from the movie Deadpool 2. I also opted for 4 year extended warranty. LOL,... Went to check out Aprilia Tuono 1100... Aprilia Tuono was sold (was an amazing deal!! ), but they had new Hyperstrada on display. I test rode the 821 HS years ago and i remember it as one of the most fun bikes I have ever been on... so the decision was made. Picking the bike up on Thursday. Very excited even though riding season is done here in Canada. They removed those scenes from the movie in the end. However, on the plus side, the bike is amazing! 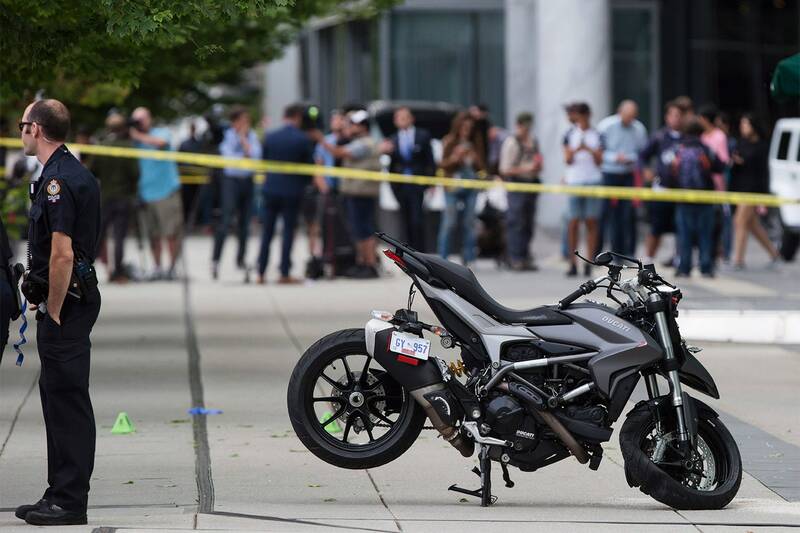 I can't remember if it was also from Deadpool 2, but last summer I was at GP Bikes and they had a 2016 Hyperstrada with maybe 30 kms on it that they said was from a movie. That was the first bike in a long time that I've fallen in love with just by sitting on it. I never would have considered one before that day.